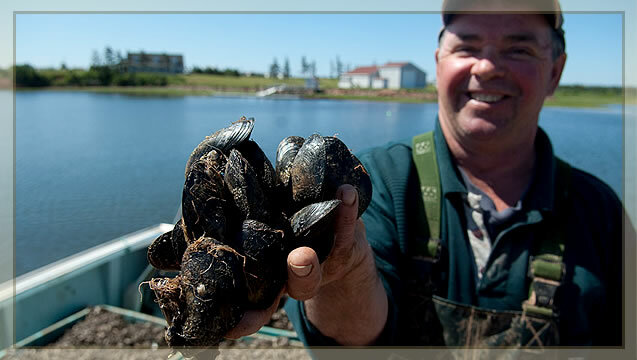 Prince Edward Aqua Farms produces their Island Gold cultivated blue mussels year-round and ships to markets in the United States and beyond seven days a week. For both wholesale and retail sales, Prince Edward Aqua Farms is committed to ensuring their products' freshness. The wet storage facilities have been expanded several times over the past five years to meet market demand. After harvesting, mussels arrive in insulated containers. They are inspected in accordance with the Canadian Shellfish Sanitation Program (CSSP) and Hazard Analysis and Critical Control Points (HACCP), then go to processing to be cleaned and graded.They are then placed into wet storage to ensure all sand and grit is cleaned out. The wet storage temperature is supplied and maintained by pure ocean water in the winter, and by salt water wells in the summer. As orders arrive, mussels are taken from wet storage and go through the cleaning, grading, de-bearding and bagging processes. A recent advancement is the use of slurry, or liquid ice, on shellfish.The slurry provides gentle, consistent and balanced temperature control, resulting in the freshest possible product. Product is loaded onto refrigerated trucks which travel on a daily basis for overnight delivery. The shellfish is packaged and shipped on the same day it is ordered by the customer to maintain the freshest possible product. Shellfish shipped from the plant are packed in their natural fluids to preserve their rich and unique flavour.